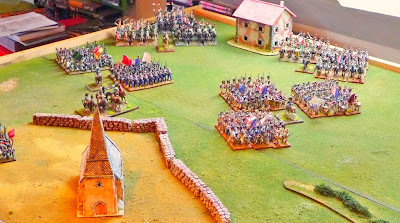 wargaming in 28 mm and sometimes smaller: Field of Glory Napoleonic:How does it look? My infantry bases are 40x40, so 6 of them are good for a small unit in tactical formation (3 bases wide, 2 deep or 120mmx80mm) and 9 for a large unit (3 bases wide and 3 deep or 120x120mm). Very close to what the rules recommend for basing (in fact better as the depth of a war-game base always overestimates the historical footprint). My first post in the FoG-N series has gone into quite a bit of depth about basing. My second post in the series looked at the play, so I am left with how does it look and does the ruleset give an accurate result. I am way too an unexperienced gamer to judge the last point, but how something looks is in the eyes of the beholder, so I said why not set up a Corps level game and have a look. I decided to take the Placenoit scenario from the rulebook and lay it out on a 8x5' terrain. The French forces involved roughly numbered 15,000 men, a smallish French corps. 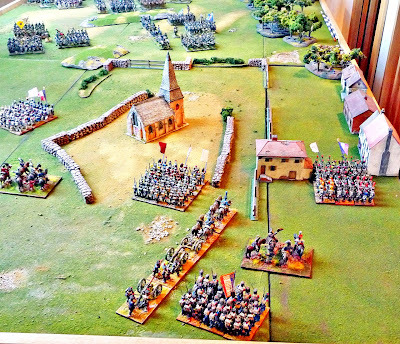 The Prussian forces roughly involved 32,000 men with the reinforcements, a average Prussian corps. I took the unit sizes from the rulebook and laid those units out in order to see the look of the thing. Here is what I got, I did not model south of Placenoit, the Bois Vivere is in the farground to the right. Looking to the east, with Hilliers 16th Bde to the right and Losthin's 15th bde. Looking to the west, one of the Cavalry divisions got cut out of the photo. Part of the VI French Corps (2 Infantry divisions) as well as 2 Cavalry divisions. The house represents La Belle Alliance. The two Prussian infantry brigades, 12th ( I believe the rulebook is in error here as it was the 13/14th Bde) and the 5th in reserve, with some units of the 5th Bde just slightly outside the 8x5 terrain. I was running out of Prussians so needed to use some KGL and some Austrians! Placenoit with the 2 brigades of Young Guards taking up procession. Two battalions of the Old Guard are in reserve. Well tell me what you think, does it look like a Corp level game? Interesting comments on the rules so far again basing sounds like an issue with these rules - On a different note - your fence line mixed with brick wall looks great did not think that wouls work but you show it does and nicely too. I'd agree, it doesn't look like a Corps level game, but it still looks pretty good. The depth of the units seems way too great in proportion to the frontage, assuming each of those fairly big blocks of troops is a Regiment or Brigade. Still, so much is in the eye of the beholder. If you make yourself think of each unit being a regt or a brigade, it will start to work for you, I suspect. 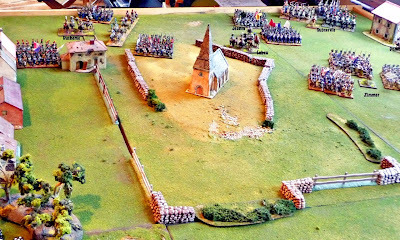 I agree with the 6mm/10mm advocates that their games "look" more like a battle, or perh\aps more aptly, a painting of a battle. That's great, but I'm happy to accept the abstractions that allow me to use my 25's on the table and enjoy their individual and collective beauty. I don't enjoy painting 15mm figures at all, anyway, and can't imagine enjoying the even smaller scales. Different strokes, and all that! 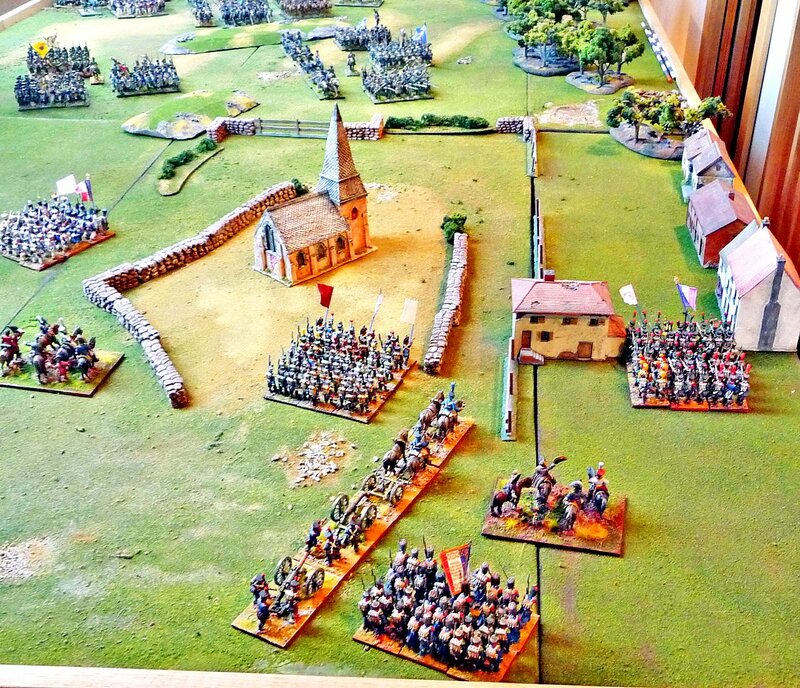 No it doesn't look like a Corps level game - I'll echo the other comments though - that is a very fine looking table! Ditto the comments on a great looking table ! I agree with Gonsalvo on the unit depth issue. Its all about the depth of the lines as far as getting the 'look' right. Unless those are supposed to be Division sized massed columns, the long lines are looking a little square. The mechanics sound pretty good though for a fast but detailed gaming experience. I like the idea of simple vs complex moves with CP point expenditure for example. But overall, I do echo your strongly voiced opinions on historical vs tournament play. Its a lamentable development for sure, but I suspect it will be short lived. When the Prussian army suffered defeat in 1806, the resulting introspection lead to a detailed analysis of the scientific and honest study of the art of war. And then we have Kriegspiel. When I first got involved in wargaming in the 70's .. we had just 'lost' a war in Vietnam, and a lot of wargaming was about serious and honest reflection on how campaigns are won and lost. During the 80s .. in the military profession, all we could think about day and night was what could we honestly do if the Red Horde (tm) ever decided to cross the border. Wargaming during this period of my life was part entertainment, part analysis, part panic. It at least had some grounding in reality. The rulesets that came out in that period reflect this. Today, 'gaming' battles is often a form of entertainment based on the enjoyment of 'winning the game'. I think this speaks more about where we sit historically as a culture today, rather than spelling any long term demise of this beautiful combination of art and study that we know as historical wargaming. Enjoyed the post - keep up the good work. I too do not thik it looks like a Corps level game. It doesn't look particularly Corps like to me. But then I'm a used to a unit equalling a battalion type of guy. Perhaps if each 'unit' was made up/modelled as multiple units with smaller scale figures ... but even then I don't see it looking like a Corps level game for me. I have to agree, it does not look like Corp level game. The 28mm scale figures look too big for the size table top. On a positive note, the troops and scenary look great. Afraid I've gotta agree with everyone else, it doesn't look like a corps level game, although the figures and table look excellent, if a little cramped. Well, I think it *does* look like a Corps-level game. But maybe that's because I'm used to playing Army level games like Grand Armee or Napoleonic DBA with 28mm figures. As soon as you start thinking of each block of figures as many battalions it all falls into place.